In the past decade, cell phone technology has expanded in incredible ways. Does it surprise you that the first-generation iPhone from Apple came out in 2007? Since then, smartphones have been designed to accomplish incredible feats, from recording video to live-streaming FaceTime video chats. Hearing aid technology has grown concurrently with smartphone advancements in the past decade. These new hearing aids are sleek, discreet, and are powered by incredibly fast processing platforms, deemed “mini-computers for the ears.” One of the biggest advancements in hearing aid technology in recent years is wireless connectivity. Now, smartphone users are able to connect to their hearing aids, opening up a world of accessibility, natural listening, and ease of control. Here at Hearing Center of Hawaii, we offer several hearing aids with connectivity to smartphones. 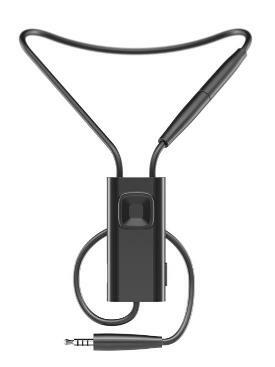 The Halo 2 is the second generation of the original Starkey Halo, one of the world’s first made for iPhone hearing aids. Awarded the Silver Edison Award in 2016, the Halo 2 offers updated features of its predecessor. Halo 2 connects to your iPhone (and certain Android phones!) through the TruLink app. 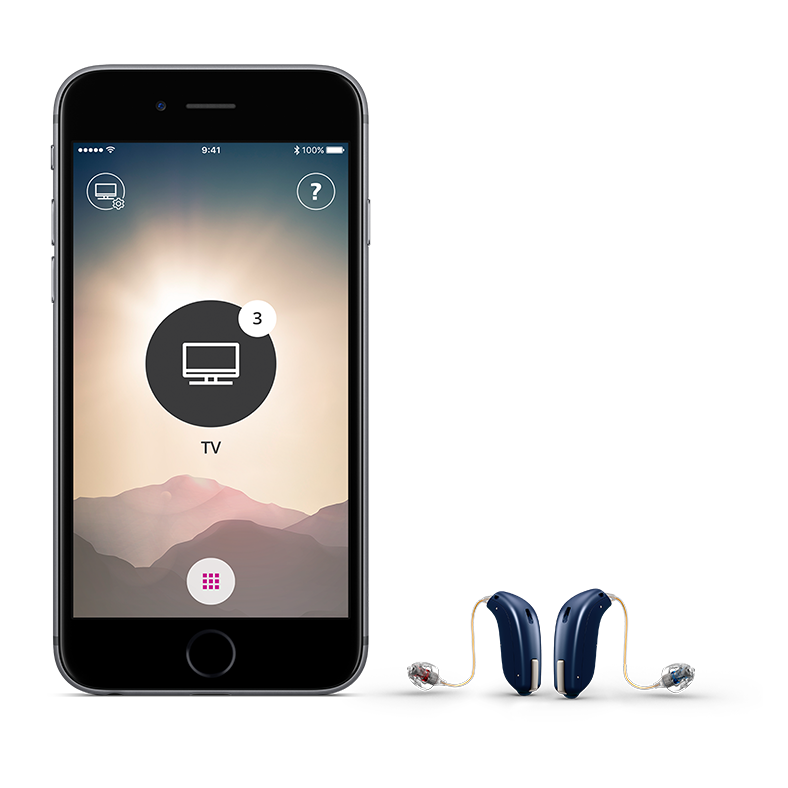 TruLink allows wearers to stream FaceTime, phone conversations, music, and other media directly from their smartphones to their hearing aids. This cuts out the feedback that would come with holding a phone next to a hearing aid. Halo 2 also activates the iPhone’s GPS function, which geo-tags locations with user preferences. When you’re in a certain space and make adjustments to your Halo 2 aids to improve your listening experience, the TruLink app archives your preferences. When you return to that location, the Halo 2 will automatically switch to your saved preferences. This provides a seamless listening experience. Halo 2 also took feedback from users into account, adding improvements to features such as clearer speech recognition and listening against background noise. Halo 2 accommodates more frequencies, making speech recognition of different speakers’ voices more accessible. The Starkey Halo 2 is available in receiver-in-canal and behind-the-ear styles, and treats mild to severe hearing loss. OPN is the newest hearing aid from Oticon, proven to reduce listening effort by 20% in noisy environments, which enables hearing aid wearers to remember 20% more in challenging noise environments, and improves speech understanding by 30% than previous Oticon models. Powered by the Velox Processing Platform, OPN provides an “open sound” solution. OPN provides wearers with the full 360-degree picture of sound in their environment. Most traditional hearing aids offer more focused listening, but OPN’s open sound solution helps the brain’s auditory process by processing sound 50 times faster, while giving wearers the freedom to decide where to focus. OPN is equipped with Oticon’s trademark BrainHearing Technology, which is designed to assist the brain hear. OpenSound Navigator Environmental Analyzer analyzes and balances every sound at 100 times a second. OPN’s TwinLink technology is a near-field magnetic communication (NFMI) that simultaneously provides wearers with a higher quality of sound and a Bluetooth connection to smartphones and other devices. 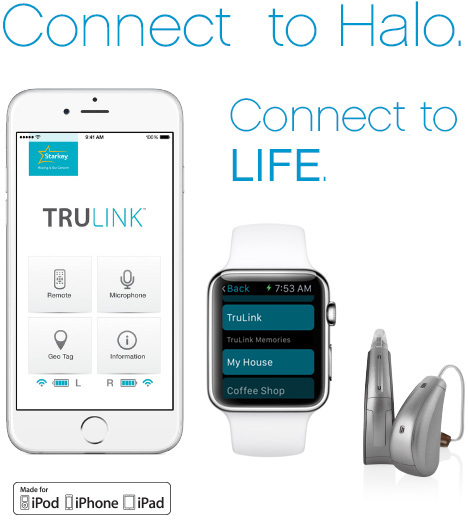 TwinLink allows OPN wearers stream phone calls, music, and other media directly to their OPN hearing aids. In a ground-breaking move, OPN is world’s first hearing aid that connects directly to the Internet. A connection with the website If This Then that (IFTTT.com) connects OPN hearing aid wearers to sounds heard in everyday life, such as doorbells and baby monitors. The OPN is available in a discreet, mini receiver-in-canal style. Widex offers a connection to smartphones and tablets with Uni-Dex, an assistive listening device. Uni-Dex is compatible with most smartphones. As an assistive listening device, Uni-Dex is worn around the neck, picking up sounds and wirelessly streaming them through a built-in microphone. Uni-Dex also facilitates hands-free phone conversations with this connection. Music and other media may be streamed through the Uni-Dex device. Uni-Dex is compatible with most smartphones, including the iPhone. It may be used with most Widex hearing aid models. Phonak’s Audeo V, Bolero V, and Naida V hearing aids are compatible with the Phonak Support App, which allows wearers to connect their hearing aids to their smartphones. The Support App is specifically paired with Phonak hearing aids on the Venture Platform. The Support App helps wearers customize their user preferences, and also offers tinnitus therapy. Phonak also offers the RemoteControl App, which allows Phonak hearing aid wearers to control user preferences, program features, and volume through their smartphones. Phonak hearing aid wearers are also able to stream phone calls, music, and media from their phones to their hearing aids. Phonak apps are available for both iPhone and Android phones. Interested in linking your smartphones to your hearing aids? Contact us at Hearing Center of Hawaii today to get connected.